More people die each year from contaminated water than all forms of violence and war combined. Did you know that just recently, the United Nations voted to make access to clean water a recognized human right? Today, October 15th has been chosen by Blog Action Day at Change.org, to be a day that bloggers all over the world blog in sync about the importance of water. So I have chosen to focus on West Virginia's environmental crisis, and to report about Citizen Magdalene Fry's valuable work on behalf of all West Virginians. As well as being my friend, Magdalene is a local Huntington resident, a good mother, and a private Citizen-lobbyist, who works for the passage of the Clean Water Protection Act (H.R. 1310, see also, Wikepedia) and the Appalachian Restoration Act (S. 696). Just a few days ago, Magdalene sent a video message to Michelle Obama in hopes that the First Lady would see it, and she might be influenced to help West Virginians who are trying to preserve our state's remaining environment and water resources from further damage by parasitic corporations. 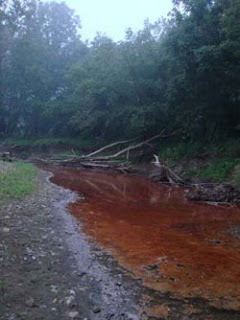 Since recognition of the human right to have access to clean, healthy water has gained the attention of the heads of government all over the world, we hope the Obama administration takes advantage of this momentum and urges Congress to pass the Clean Water Protection Act and Appalachian Restoration Act. I add my full support to Maggie's work. She's walking the talk, rather than just talking or doing nothing. I also live in West Virginia, and appreciate her devotion to having clean, safe water, and beautiful forests and mountains. We all need to band together and put a quietus on the fat-cat owned, parasitic companies who have been dumping their life-killing filth into our environment. Watch Magdalene's powerful message and then contact your representatives in Congress and demand that they pass the Appalachian Restoration Act and the Clean Water Protection Act. Some background about West Virginia's environmental problem: For decades mining companies and other industries have mutilated West Virginia's beautiful hills, mountains and streams by removing mountain tops to access coal, and filling in ravines and streams with the earth removed from the mountain tops. 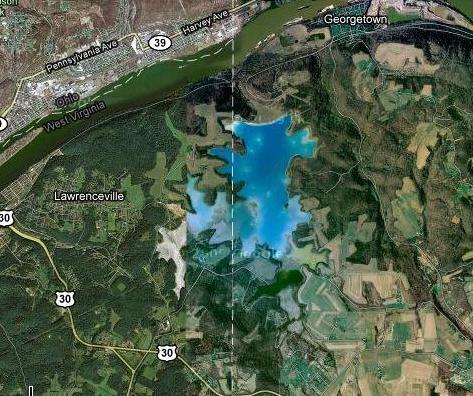 They've dumped their industrial wastes (poisons) into our environment, contaminating our ground water, slowly poisoning West Virginians, and devaluing their real estate. In our still gorgeous state, you'll be sickened to be driving through a beautiful forested area, and suddenly see a turquoise colored stream, or see a lake or a pond filled with brilliant-colored water. Much of our clean water is no longer fit to drink or safe by any reasonable standard, and our native fish are contaminated with mercury. We have underground storage tanks scattered all over the state, put there to "protect" us by "containing" industrial toxins. Blog Action Day is an annual event held every October 15 that unites the world’s bloggers in posting about the same issue on the same day with the aim of sparking a global discussion and driving collective action. 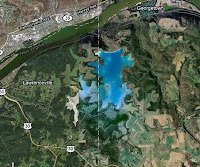 I am a citizen blogger, and today, I am using the networking power of the Internet to call attention to West Virginia's environmental crisis that affects our water. Please add your support and join the community of individuals and organizations who are working to protect West Virginia's environmental legacy. Demand passage of the Appalachian Restoration Act and the Clean Water Protection Act!